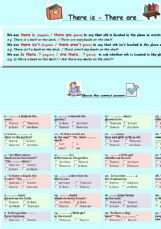 A simple multiple choice practice for elementary students. Useful while learning the use of There is - There are. It´s based on my WS, that I made some time ago. Hope you like it! I like this exercise. Thanks for your effort.